#roundirelandspeedrecord – Musandam-Oman Sail - flagship of the Sultanate of Oman - completed the Round Ireland speed sailing record attempt this morning just before 1100 taking three hours off the 22–year–old record, breaking Steve Fossett's long standing record of 44 hours with Lakota in 1993. The 70–foot Multihull screamed past the Muglins Rocks on the outskirts of Dublin bay at over 30–knots to claim the record in a time of 40 hours, 51 minutes and 57 seconds. The record officiated by Irish speed sailing commissioner Chris Moore from onboard a DBSC committee vessel has yet to be ratified by the World Speed Sailing Record Council. On coming ashore at the National Yacht Club the first call by French Skipper Sidney Gavignet was for a doctor to treat a crewmans shoulder due to an injury sustained on the 700–mle journey that started at 6pm on Bank Holiday Monday. Onboard with Gavignet are Alex Pella from Spain and Jean Baptiste Levaillant together with three Omani sailors and skipper Gavignet. Sadly for this attempt, Ireland's offshore supremo Damian Foxall was not on the crew list. Strong winds this morning on the Wicklow coast presented ideal conditions for the closing stages of the record attempt for the professional crew who travelled the last 100–km in little over two hours. The scenario was much different to 12 hours earlier when the 70–footer was more–or–less beclamed off the Mayo coast. The tired and successful crew came ashore at lunch–time and ordered steak and chips at the National Yacht Club to celebrate the fastest ever sailing circumnavigation of Ireland. "This is a great accomplishment for Oman and Oman Sail," said David Graham, CEO of Oman Sail. "Attempting to break the Round Ireland record has been our goal for many years now and achieving the feat is a shining example of the hard work and dedication of our sailing squad. Racing against yourself to set a time is the hardest test of discipline. The team must remain focused and motivated at all times, and we have instilled these values since the start of the Oman Sail programme. With a 50% Omani crew, this record shows that the present and the future of sailing in Oman is on the right course." The crew needed to be back by 1500 to take the record but their breakneck speeds down the west coast of Ireland, at one stage reaching 38 knots, meant they were finished well before that, some three hours and 50 minutes faster than the 44 hours and 42 minutes set by Steve Fossett in his first ever world record back in September 1993 aboard his 60ft trimaran Lakota. Helmsman Fahad Al Hasni said this record attempt coming at the end of a European winter, had proved tough. "It was both scary and exciting because we saw 40 knots of wind and massive waves that we reckoned were around six metres but the main challenge was the cold," said Al Hasni. "It is still winter here and my hands were so cold I still can't feel them but I'm really happy because there have been some very famous sailors who have made attempts on this record but we are the ones who now hold it. We have become a really good, tough team and it feels great to be part of it." It had been a challenging but amazing experience for the Omani sailors, added Gavignet, who was full of praise for his crew. 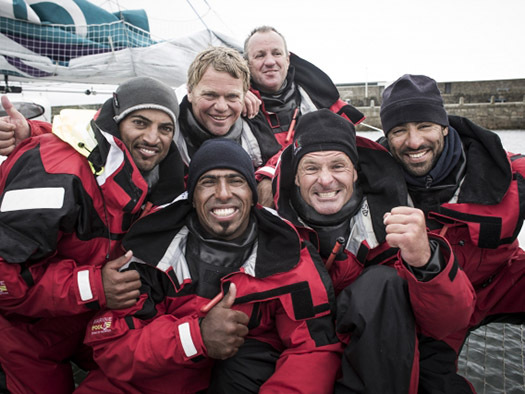 "This was a real test for them and they came through with flying colours – the whole crew put in a great effort. "We had to be very careful in these conditions and had no choice but to slow down at times but to have achieved the record so early in our season is a great feeling. It had been a priority and now it is done." 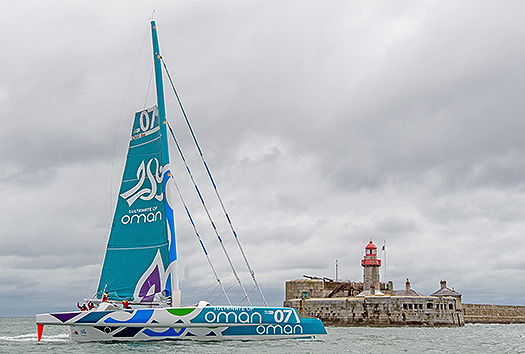 This was Musandam-Oman Sail's second attempt on the Round Ireland record. Two years ago they set off from Dublin Bay with high hopes but were forced to abandon due to unsafe conditions. Today was a different story and everyone on board was delighted to add this one to their burgeoning collection.